I know you’re all DYING for an update on my dating life (she says dripping with sarcasm…). Well, the highlight right now is the homeless guy who threw his lunch at me the other day. I think it was a unique form of flirting, and in that sense, almost flattering… So, you can see I’m in a bit of a low period. I have deleted all my dating apps, though. After all my defending of Tinder, I was finally convinced that there are very few (read: none) people on it with honest intentions. The rest of the apps were just too much work. So, if I don’t meet someone the old fashioned way – in real life – I may just die an old maid. Que sera, sera. Seriously, though, florals and stripes are my favorite way to mix patterns – and a pretty simple way to pull off that trend successfully. My pants are a soft pink and white stripe that pairs well with the pink in my blouse. Since neither piece is too bold and both in the same color palette, mixing the patterns was easy. I added a green tank and purple shoes, because, you know, I like to wear as many colors at once as possible, and my Easter egg outfit was complete (self-deprecation aside, I loved this look). 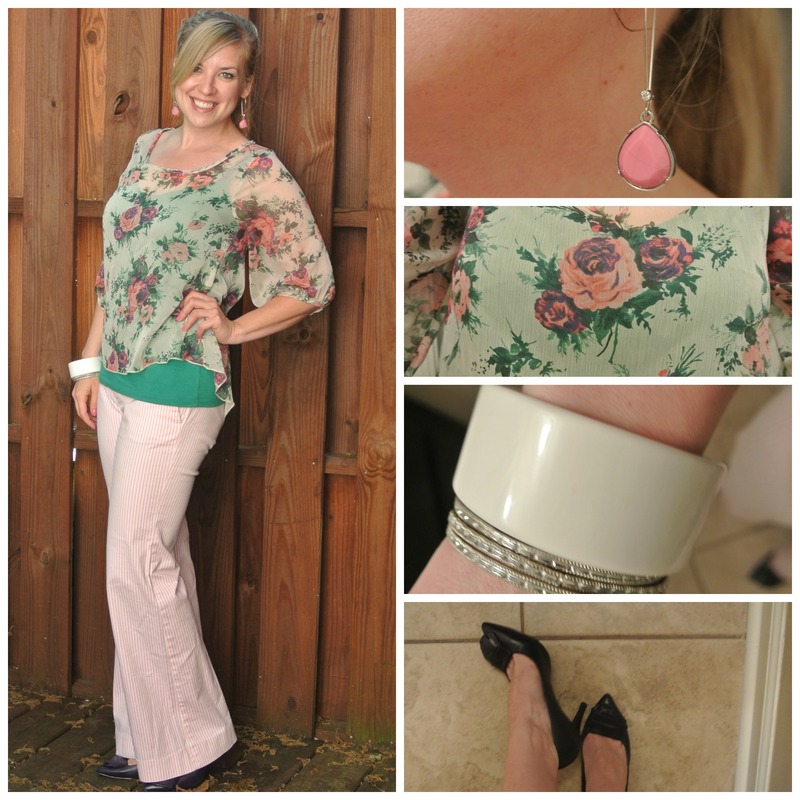 How do you feel about florals? Old lady or on-trend? Would you pair them with stripes, another pattern, or only solids? Let’s talk! A surprisingly common misconception about me on dating sites is that I’m tall. I finally asked someone why they thought that, and he said I was almost the same height as the Christmas tree in one of my pictures. Valid point, except my tree is short, and my heels are high. It usually gets awkward after they learn that. Oh well. 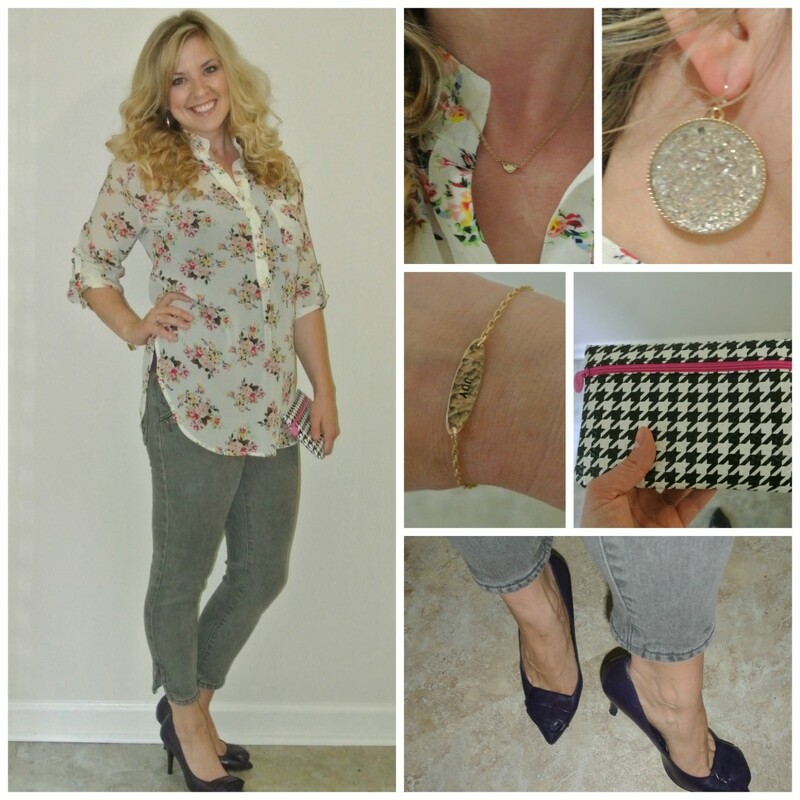 Obviously, this is not a current outfit, but I liked it and haven’t blogged it yet, so here we go. I bought these “slips” online a year or two ago to go under a sheer dress, and they’re basically just a super stretchy, long tank top. 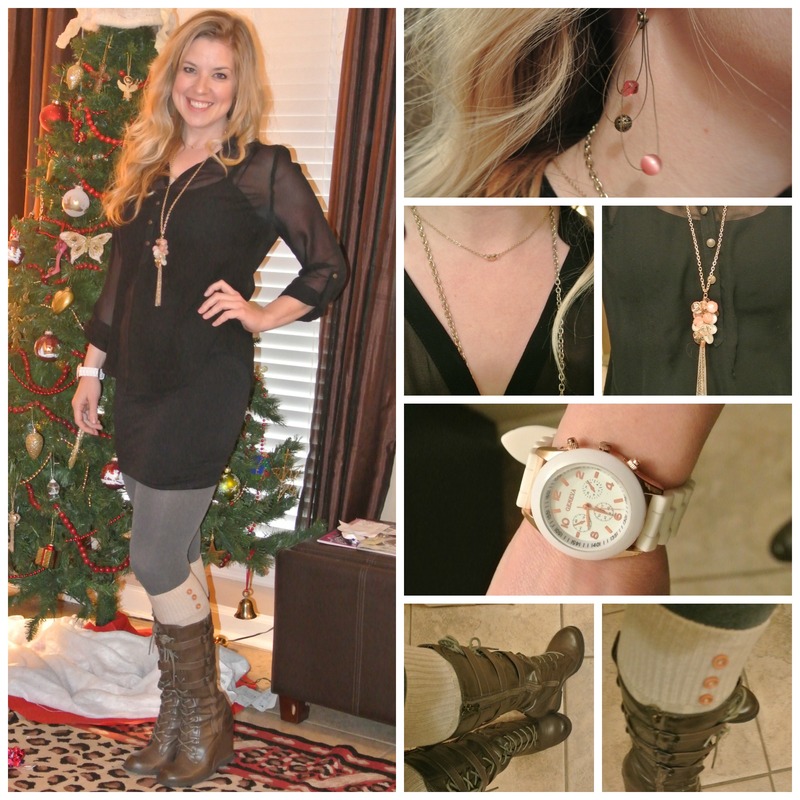 I really love them as a base layer with leggings – and in this case, boot socks. There are a lot of bottom half layers happening in this look, and I say the more the merrier. That’s about all I have to say on this one: all neutrals, but enough going on with details to make it interesting. And a touch of pink in my jewelry – naturally. Happy Monday, everyone! Let me know if you think I look tall, or have any other comments at all. I love hearing from you! Lest Tuesday’s post makes you think everything in my life is perfect, let’s talk about my dating life. A couple weeks ago, I wrote a post about a Match.com experience I had. I never advertised the post, because I wasn’t sure it was that entertaining. Maybe in the context of this bigger post, it fits better. Feel free to read the (one-sided) conversation, if you’d like. An introductory message that read simply, “drinks? ?” At least he’s efficient. A man who after sporadically talking to me for a month, finally asked for my number and then said he’d “probably” call me that weekend. And got mad when I said I’d “probably” be around. Another man who suggested we go on a date next week and when I responded with my availability, SHUT DOWN. I haven’t heard from him since. The Proverbs 31 guy. His message said I seemed like a Proverbs 31 woman, which was confusing to me because I didn’t talk about dyeing clothes or purchasing land anywhere in my profile. I honestly haven’t been on a date in months, which is fine because I’ve been busy, but sad because I really like going on dates. 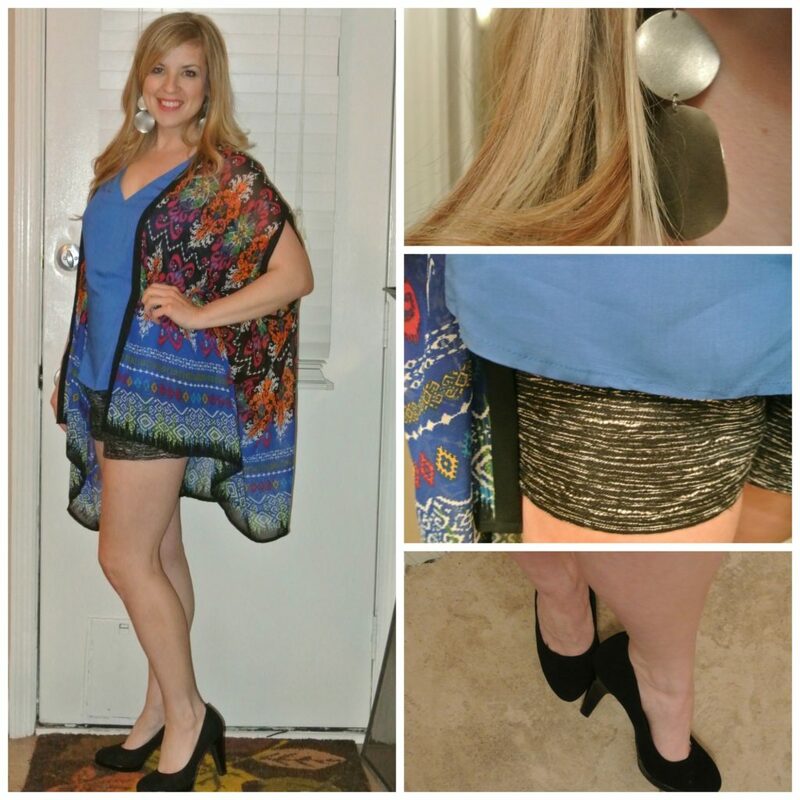 If I did go on a date, though, I’d probably wear something like this because my colorful kimono and dressy shorts are my new favorite things. Instead, I wore them to a friend’s birthday party which was also fun. Anyone else have good dating stories? Please let me know I’m not alone in this crazy, ridiculous online dating scene. Right?? This summer is a busy one for me, as I’m in two non-local weddings. So that means flights, showers, bachelorette parties, and pretty things galore. (It also means two of my single girl hold-outs are abandoning me (insert sobbing face emoji x3)). Anyway, the first bachelorette party was this weekend, and I didn’t even have to go anywhere. If you didn’t know, Nashville is, without hyperbole, the bachelorette party capital of the US (Vegas is the guys’ version). So, this weekend I got to play tourist in my own town (coming up on 6 months living here, y’all, so I’m definitely a local now), and it was so fun. Of course, as every good bride (and bridesmaid) knows, every bachelorette party must have a theme, and ours was Bachelorette in the City. So, we got to go the classy route, wearing black and white with pink accents. I didn’t have a chance to get a full-length picture of my outfit by myself, but I’m sure you’d rather see me with the bride, anyway. She looked so pretty in her sparkly, white dress, didn’t she? At the beginning of the season, I always feel a little “over-exposed” wearing strapless things or shorts, but I do love this romper so much, and since most of my closet is a little more colorful, I had limited black and white options, anyway. 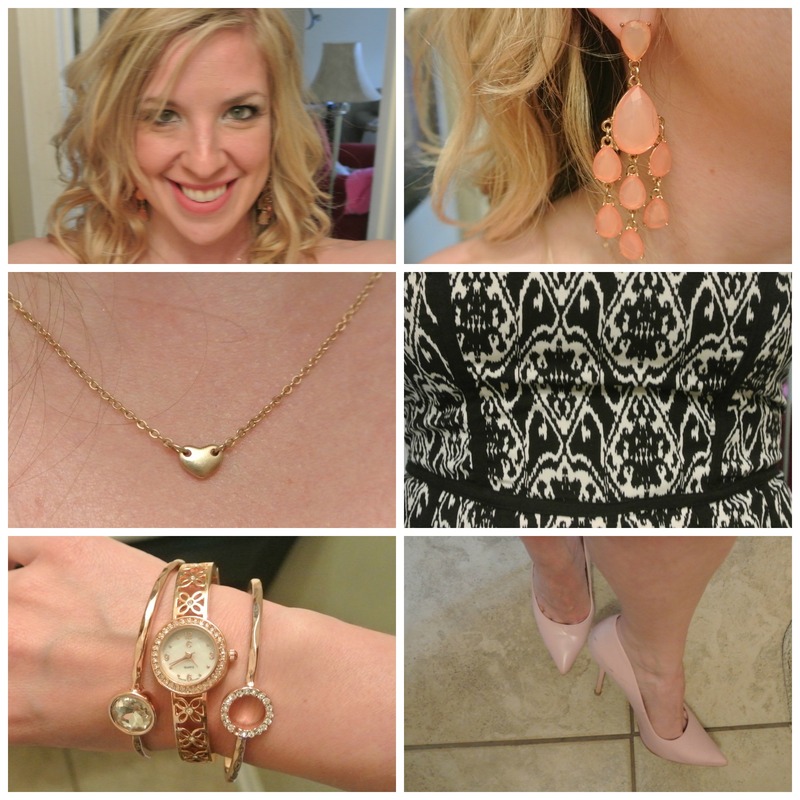 Tack on some pink earrings, pink pumps, and some complimentary gold accessories, and I was on-theme and ready to take over Broadway. What was the theme of your bachelorette party? Or what would you like to do when the time comes? Let’s chat! I had previously been on a few dates, but I wasn’t really looking to actually date then – they were isolated incidents. Trying is really the key word here. The process is slow. I joined Match.com again, in hopes of a better pool. I still think Tinder is the most efficient way to meet people, and by and large, Tinder guys are more attractive than on any other dating app/site. However, while I don’t think finding someone who shares my values and actually wants a relationship is impossible on Tinder, I figured my odds were a little better on a paid site. So, because the guys on EHarmony are weird, and the ones on Christian Mingle insist on referencing the Proverbs 31 woman in every profile, Match.com was the obvious choice. B: so excited. Huge money. B: Want me to leave u alone ? And that’s where the messages ended. If you noticed an absence of S: comments, that’s because there were none. B was determined, though, and the one-sided conversation continued for about three hours. I kinda felt bad for him in a general sense, but I can’t engage with that. Also, what if I had legitimately been busy? He was assuming I was on my phone reading these messages in my inbox in real time (I was), but what if I’d been at church or for a run – or on a different date? Really, though, I’m (somewhat) optimistic. The pool may not be awesome, but it’s certainly better than in small town, Georgia, and, as my mother always says much to my annoyance/eye rolls, “it only takes one.” Plus, I’m talking to a guy right now who used the word “egregious” correctly in a sentence, so the future is looking bright. Have you ever been the recipient of these kinds of non-stop (or otherwise troublesome) messages on Match/dating sites? Do you ignore like I do, or do you respond – and if so, how? (I read an article about a girl who messaged guys on Tinder using only Lorelai Gilmore quotes, and I was a little bit jealous of her ingenuity.) Please let me know I’m not alone! When I moved to Nashville, I made a promise to myself not to use any online dating platforms for the first several months that I lived here. I wanted to get settled, find a job, focus on other things, and ideally, meet someone “organically”, before I gave online another go. For the most part, I’ve kept that promise…with one notable exception. To really understand this story, we have to go back a week before Thanksgiving to an occurrence seemingly unrelated…stick with me. On a random Wednesday night, a couple friends were in town, so we did what you do when friends are in town in Nashville – go to the honky tonks! As we’re dancing, I noticed the band guys (two brothers) were kinda checking me out. I didn’t want to be rude to my dance partner, though, so I just took a picture of their album cover (legitimately, I liked their music), planning to look them up on Instagram. A couple days later, I remembered to do that, followed them, and imagined that they might remember me out of the hundreds of people they saw that night. They did not immediately follow me back, and that was the end of that. I thought. Fast forward to Thanksgiving, and I look at my phone to see an Instagram notification that one of the brothers had followed me back. Interesting, I thought – maybe he did remember me? Shortly thereafter, I got another notification, this time from Tinder. Naturally, curiosity got the best of me, so I logged in to check and then started scrolling through matches, when I came across a “Super Like” (Tinder has these now. They’re weird), and low and behold…it was the other brother! For you to properly understand the irony of this, I think you might need a better understanding of how Tinder works. Tinder is based solely on age and geographic location – so, my parameters are ages 27-40, within 30 miles. In Nashville, that’s an awful lot of men, especially at Thanksgiving when so many people would be around who aren’t regularly. Additionally, people can pay to change their location so that if they’re out of town, they can still use Tinder in their home city. This was the case with the band guy – he was actually about 3 hours away, but using Tinder in Nashville. So, out of the literally thousands, maybe hundreds of thousands of men I could have come across on my first Nashville use of Tinder, I came across one that not only I’d seen before, but whose brother had just followed me on Instagram. I couldn’t resist liking him back, if for no other reason than to see how this drama between the brothers unfolded… But, in an anticlimactic end to this story, Instagram brother never talked to me after all. Either they resolved it among themselves (I like to assume they arm wrestled over me), or he was just following me for the sake of the band (the much more likely scenario). Did you ever have to make up your mind? Say yes to one, and leave the other behind. It’s not often easy, it’s not often kind, did you ever have to make up your mind? Have you ever seen someone on an online dating site that you knew – either by face only, as in my case, or that you really knew in real life? Which site was it, and how did you respond? I found a good friend on Match once, and it was interesting to read his profile as I would a potential date’s…he did a good job of representing himself well. Let’s here your stories, and have a great weekend! Y’all, we need to have a serious discussion. I’ve noticed an alarming trend in my recent dating life, and I don’t know if I’m the crazy one here, if I’ve lately just found more duds than usual, or if culture changed when I wasn’t looking. But, men have stopped paying on dates. 1 paid but only for my two drinks – never offered to buy dinner, even though we were together from 5:30-8:00 pm. You know, dinner time. 1 paid but said I could get it next time. I’ve tried to analyze this situation. Of course, none of these were technically “dates”, if you define date by a man saying, “I would like to take you on a date”, vs. “hey, wanna hang out”? For the sake of the discussion, we can use that excuse, but it doesn’t really hold water since two of these “non-dates” paid. We could blame it on them not having much money, but 5 of these 6 are very gainfully employed. All of them knew I was not (not that it’s other people’s responsibility to pay for me because I’m broke – that’s not their fault, and I’m no socialist. But remember, this is a dating situation). We could say this was just a Northern thing, but one who paid is from Illinois, and one who didn’t, born and bred in Georgia. All live in the South (and are evenly divided between Georgia and Tennessee…so that’s not it, either). So, the only similarity I can see between those who paid and in contrast to those who didn’t is age. The two who paid are over 35. All of the rest are under. I’m enough of a feminist to feel a little bad that men have to pay all the time and to appreciate that (under usual circumstances), I am perfectly capable of buying my own dinner. But, that’s not the point. Society has dictated for centuries(?? ), that when a man and a woman go out, the man pays – or at least the person who did the asking pays (in this case, the man, of course). Also, up until two months ago, I don’t think I’ve ever once paid on a date. So, what’s going on? Has every millennial man conspired to stop paying for us independent women? And why now – I’ve dated men my age (or younger) before, and this is a new phenomenon. Or, are my expectations just antiquated? If this is the new world, I’ll adjust – but I just want to know if I have to. What do you think? If you’re a woman, have you ever paid (on a first date)- does that bother you? Men, what do you think – should guys be expected to pay? Please discuss because I need to know how big of a line item to put in my monthly budget for dates.